This plugin integrates UPS Shipping Rate API with J2Store. Prior to configuring the plugin, you should have an active account with the UPS and received API keys. Contact UPS to register and get API keys. This is actually the shipping account number provided by the UPS. UPS will provide 2 types of parcel packing methods. Each product considers as a separate unit and packing it into the individual boxes. Each product will be packed separately. The box packing included with this shipping method lets you group items into packages for which you have to define height, width, length, weight and max weight. Packing is mainly volume based but also considers item size. UPS Packing box offers more box packing tyoe which are listed here. You have to choose/select more than one option from the list. UPS tube accommodates and protects larger documents which should be rolled rather than folded. Use the tube for blueprints, charts, maps, drawings, or posters. Charges are based on the billable weight and zone. UPS Pak accommodates Padded, secure, or watertight boxes for sensitive or regulated items; size varies. The maximum size of the box is 13in x 11in x 2in. The maximum size of the UPS Express box is 16in x 11in x 3in. The maximum size and weight of the box are 18in x 13in x 3in and weight limit 30lbs. The maximum size and weight of the UPS 10 kg box are 16.5in x 13.25in x 10.75in (42cm x 34cm x 27cm); weight limit 22lbs/10kg. If you choose box making then you have to define/set box size. The box will have the following fields. Name: This allows you to name your custom packages. This name will show in the Debug if that package is used. L (in), W (in), H (in): The first set of dimensions are the outer dimensions of the package. These are the dimensions passed to the API. If you are working with a flat rate box via the API (i.e., Regional Boxes), use the API’s ‘inner dimensions’ for your box’s outer dimensions. Your box must ‘fit’ inside. If you would like to use the UPS in test mode then set this option to 'yes' otherwise set the test mode as 'no. UPS will provide confirmation of delivery without the recipient's signature. Signature Required :UPS will obtain the recipient's signature and provide you with a printed copy. You may also view the recipient's signature online. Adult Signature Required :UPS will obtain the adult recipient's signature and provide you with a printed copy. You may also view the adult recipient's signature online. Direct Delivery Only ensures a package is delivered to the residential or commercial address you provide.It does not require the signature. If you set ist 'yes' means direct delivery gets enabled. If you set it as no means direct delivery does not get activated. Choose the shipping services that you would like to provide to the customers. NOTE: Services depend on the customer's shipping address. Even if you chose many services here, UPS will show only the services that are available to the customer's shippingdestination at the checkout. Wholesale - If you are billing to a UPS account and have adaily UPS pickup, Occasional - If you do not have a UPS account or you are billing to a UPS account but do not have a daily pickup, Retail - If you are shipping from a retail outlet (onlyused when the origin is the US). Valid Units are Kilogram (KGS), Pound (LBS). IMPORTANT: You must choose a weight unit here. Otherwise, the plugin will not work. If you are using more than one weight unit for your products, then the plugin will automatically convert to the weight unit you are choosing here. ExampleProduct A – Weight is 5 KG , Product B – Weight 7 Pounds. You have set the Pound as the weight unit in the plugin params.Then the Product A weight will be converted to pound, according to the values provided at the Weight Classes section (J2Store admin –> set up –> weight classes). Set this to yes to show the total weight of the products in theorder to the customer during the checkout. The weight will appear next to the shipping method name. The plugin will not convert the length unit. Make sure that you are using the same length unit for all your products. If you want to charge tax for shipping cost, choose a tax class here. Otherwise, leave this field empty / do not select any option. 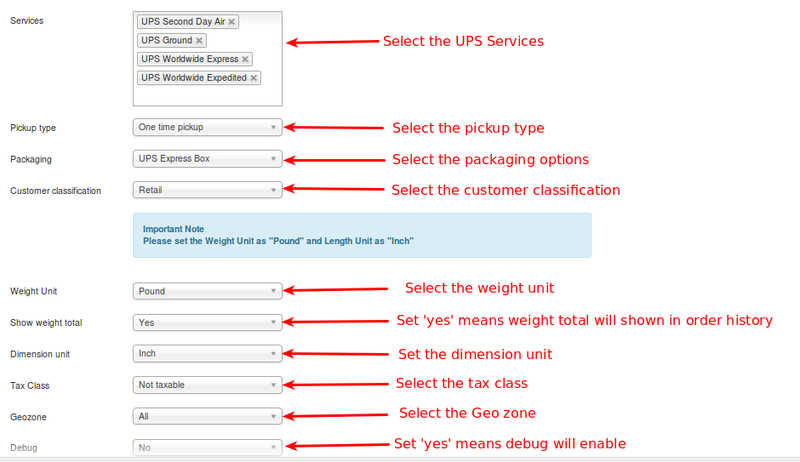 You can select a geo-zone and restrict the availability of this shipping method to the countries/zones in that geo zone. 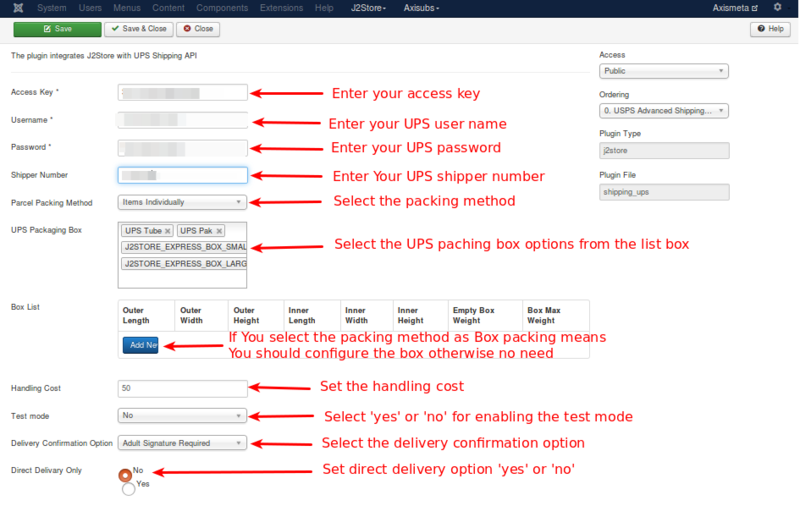 Leave empty / unselected for making this shipping method available to customers from all regions. If you set this to yes, then debug messages will be logged and saved in the cache folder in your Joomla root directory.